Harris was a prolific and highly skilled aquatint engraver whose work epitomises the Victorian love of sporting and coaching art in the middle of the nineteenth century. He produced some of the finest sporting prints of his day and worked for well-known publishing firms in London such as Ackermann and Fores. He was born in London in 1811 and spent his entire working life in the capital although the vast majority of his output comprised depictions of rural life. 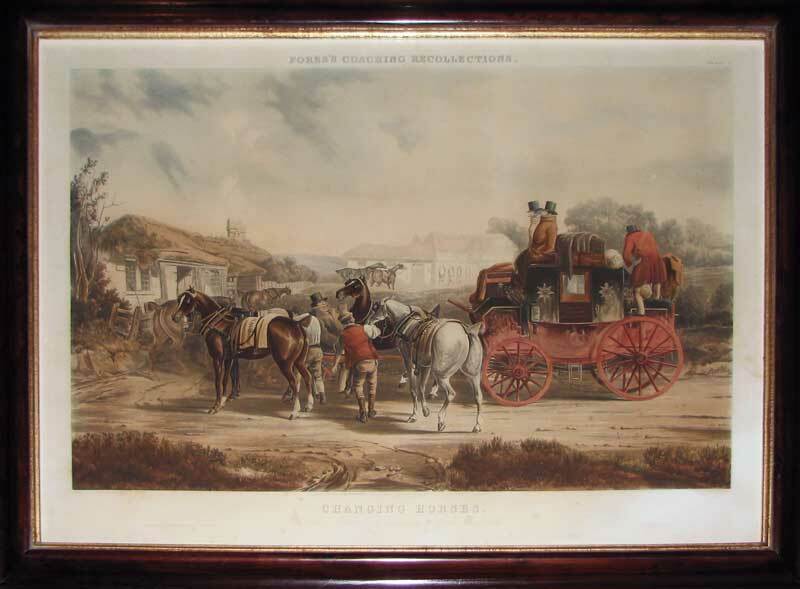 In this particular print we see Royal Mail Louth to London coach changing horses on the journey south. Charles Cooper Henderson (1803-1877) was born into a privileged family but was disinherited by his father after his marriage to the daughter of Charles By. Consequently, he was forced to make his own way in life and turned to art as a means to secure an income. He was fascinated by coaching scenes and life on the road and these subjects dominated his output.